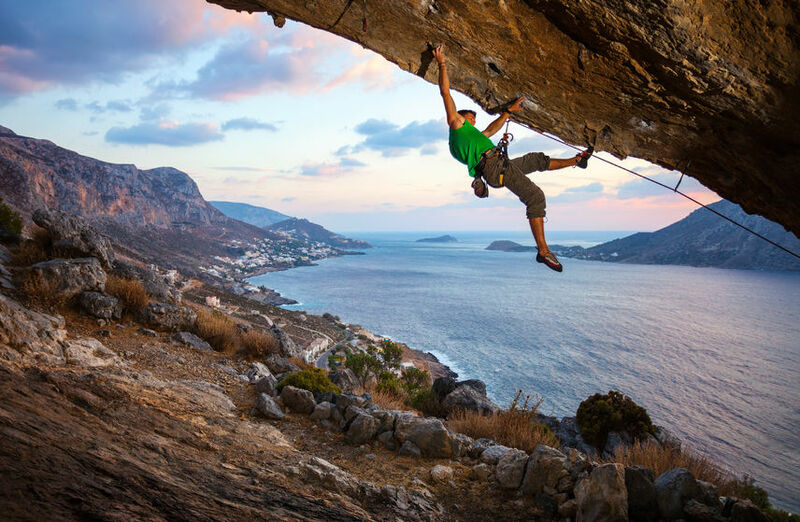 Impingement Syndrome Surgery (Video) - Jeffrey H. Berg, M.D. Fortunately the need for impingement syndrome surgery is rare. I estimate that only about 1 in10-20 people ultimately requires surgery. However, when nonoperative treatment fails, there really are only two choices: live with the symptoms or have impingement syndrome surgery. What defines failure of nonoperative treatment is really up to you and your doc. There is no harm tolerating the symptoms for as long as you like. Prolonged impingement syndrome does not appear to lead to any other issues. Furthermore, if surgery is ultimately performed, waiting does not seem to impact outcome. So you and your doctor can continue with nonsurgical treatment as long as you like. However, if nonoperative treatment doesn’t work after a reasonable period, the likelihood of that treatment ultimately working is not great. Therefore, you will have to make a decision how to proceed. The goal of impingement syndrome surgery is to remove the inflamed, painful bursa and increase the space between your rotator cuff and your acromion, if needed. This is called a subacromial decompression. 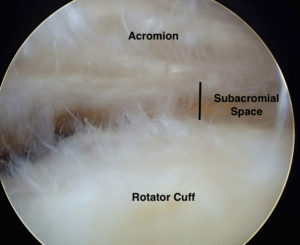 Sometimes, if the subacromial space is wide enough, it is enough to simply remove the inflamed bursa. Don’t worry – it grows back uninflamed. In other cases in which there may be an acromial spur narrowing the subacromial space from above, it is necessary to remove the this spur (Acromioplasty). This essentially “raises the roof” and increases the subacromial space. Either way, the procedure is relatively quick and simple for most shoulder surgeons. Most often, the surgery is performed arthroscopically. However, if needed, impingement syndrome surgery can also be performed through larger incisions. 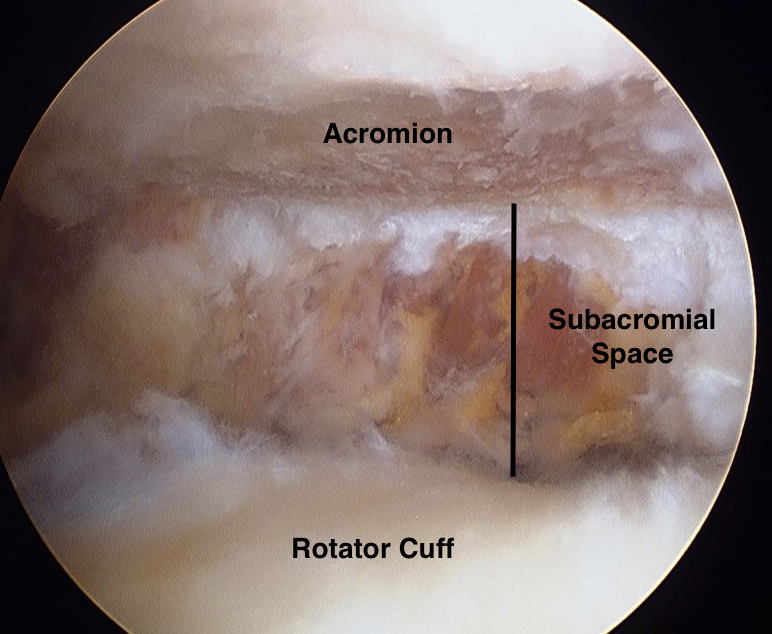 Below is a short video of an arthroscopic impingement syndrome surgery. The risks from this surgery are rare and are those common to most surgeries, but much less frequent. These risks are : anesthesia and general medical risks, risks to nerve and arteries, bleeding, infection, blood clots, wound healing issues, stiffness and failure to fully recover. Of these, in the healthy patient, stiffness is the greatest risk by far. Fortunately, even this is quite rare. Overall, impingement syndrome surgery is a relatively safe surgery. This surgery also usually has a comparatively quick and predictable recovery. Typically you will be able to go home the same day of your procedure. In most cases, a sling is only needed for 1-2 days. I usually begin physical therapy a couple days after surgery. Most people continue therapy until their function is acceptable – which can take as little as 1-2 months in some. Improvement from your preoperative pain is usually felt within 1-2 months, as well. Full recovery usually takes 3-4 months but can occasionally take up to 6 months in the rare case. During the recovery, your activities would only limited by your pain and other symptoms. If it doesn’t hurt much, you can really do whatever you’d like. Subacromial impingement syndrome is a very common shoulder problem. Fortunately, it often resolves with nonoperative care. When this treatment doesn’t work, however, impingement syndrome surgery can cure the problem. So, if you have impingement syndrome and are not getting better, it may be time to seek an evaluation from a shoulder specialist.